You may know lowcountry as a region of South Carolina’s coastal area. I didn’t know about that lowcountry until I looked it up. But you might simply know more than I do. The lowcountry I know is located in the West Village. It is not a cultural or geographic region, nor is it known for its historic communities. (Or is it?) Lowcountry is a delightful restaurant specializing in southern fare that will knock your socks off. First things first, biscuits. 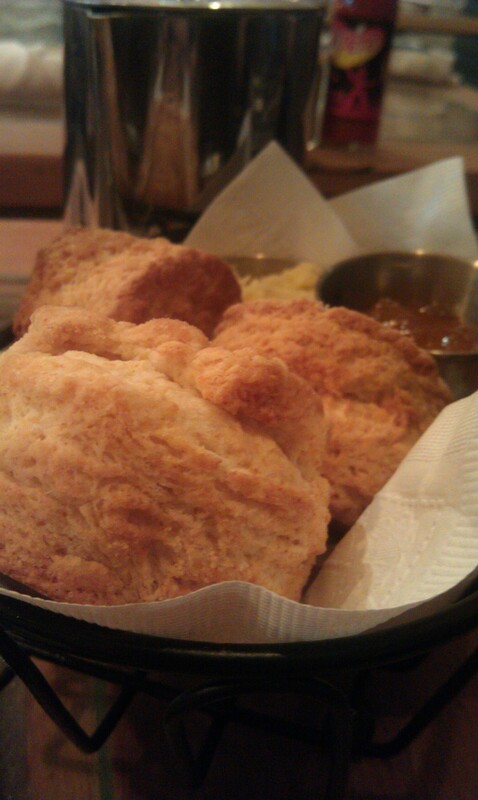 How enjoyable could any brunch be without biscuits? It couldn’t be. Plain and simple. Lowcountry wisely boasts two biscuit-based sandwiches on its menu: the breakfast biscuit and the fried chicken biscuit. Now, the breakfast biscuit is only available for Sunday brunch, while the fried chicken biscuit can be ordered at dinner–believe me, it’s good any time of day. A piece of fried chicken between two sides of a heavenly cheddar biscuit with a bit of onion jam and sausage gravy poured over it. You can’t go wrong with that combo. They served us three biscuits. My dining partner and I split the first one and each ate a whole. The biscuit perfectly complimented my country breakfast, which consisted of eggs, sausage or bacon, roasted tomatoes, mushrooms, and incredible cheddar grits. I can’t stress how delicious the grits are. They’re creamy and cheesy and better than any grits you’ve ever tasted in your life. I’m certain southerners are impressed with lowcountry’s grit aptitude. 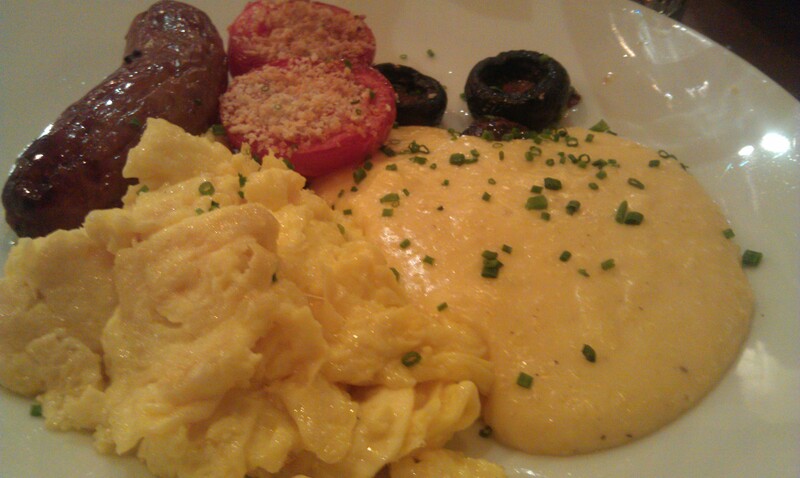 Because I’m not a fan of runny eggs, I always order scrambled eggs. Sometimes they’re dry, other times they’re too watery. Lowcountry’s scrambled eggs were just right: slightly firm, yet moist-enough. I enjoyed everything on the plate. My dining partner ordered huevos rancheros. 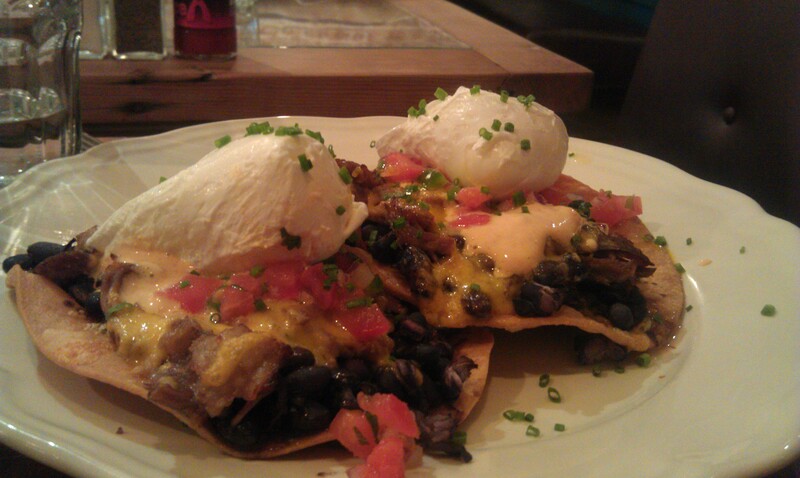 Lowcountry’s take on huevos rancheros features poached eggs and pulled pork with cheese and beans piled on two tortillas. He said he loved every part of the dish. Maybe you should try it, too. Last time we went to lowcountry, we ordered the Kentucky Hot Brown. Today, I heard one woman tell a waiter she wanted a Hot Brown for the table. What’s a Hot Brown, you ask? It’s French toast with smoked chicken breast and tomato Applewood bacon laid on top drenched in a cheddar – Bechamel sauce served with Old Bay fries. It’s weird and divine. I highly recommend lowcountry. If I knew more about South Carolina, I might recommend their lowcountry, too.